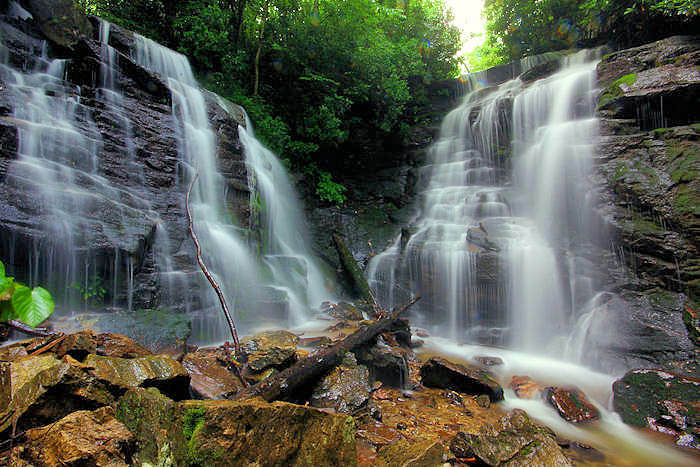 Mingo Falls, called Big Bear Falls in the Cherokee language, cascades nearly 200 ft. down granite boulders. It's located just five miles from the entrance to the Great Smoky Mountains National Park on Big Cove Road (past several big campgrounds) near the town of Cherokee. 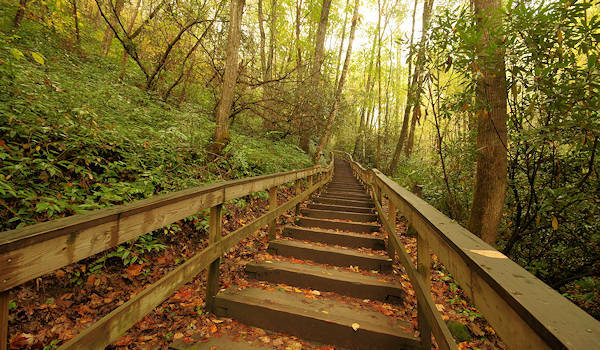 The beautiful 1/4-mile hike to the waterfall along the rushing stream is short, but you must climb 161 steps. At the top of the stairway, a short path past impressive rock outcroppings leads to a viewing bridge at the base of the falls. The waterfall is especially impressive after some big rains. The stairway to a piece of heaven... 161 steps up. 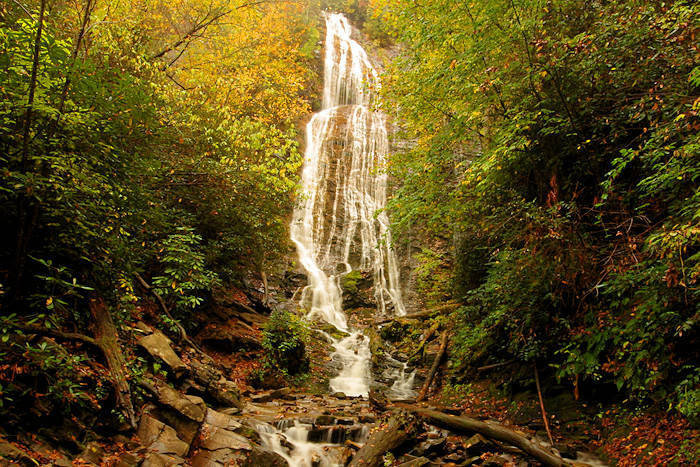 Cherokee people who live on the Qualla Boundary enjoy this waterfall as one of the beautiful places to visit on tribal land. Early morning is our favorite time to visit. Morning fog adds to the magical feeling. Plus, you can enjoy the falls before other people arrive. It is free to visit and open every day. Directional signs are limited, so take note of directions below! 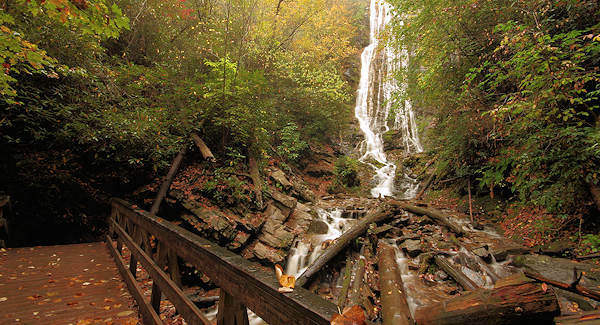 The observation deck allows a beautiful and safe view of Mingo Falls. Directions: From U.S. 441 in Cherokee (near the entrance to the Great Smoky Mountains National Park), turn onto Acquoni Road, which runs beside the Oconaluftee River. Proceed to Saunooke Village shopping center, then turn right onto Big Cove Road. Drive five miles. Look for signs and parking on the right. 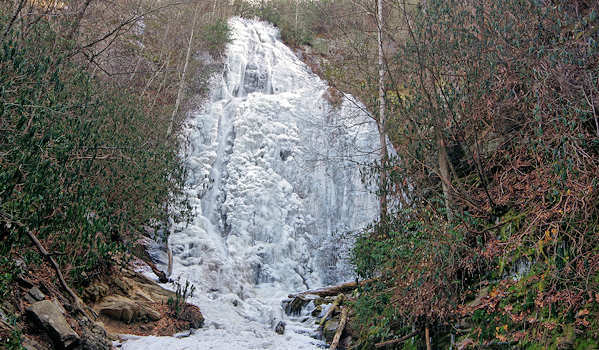 During extreme cold periods in the winter, a frozen Mingo Falls is even more amazing to see! 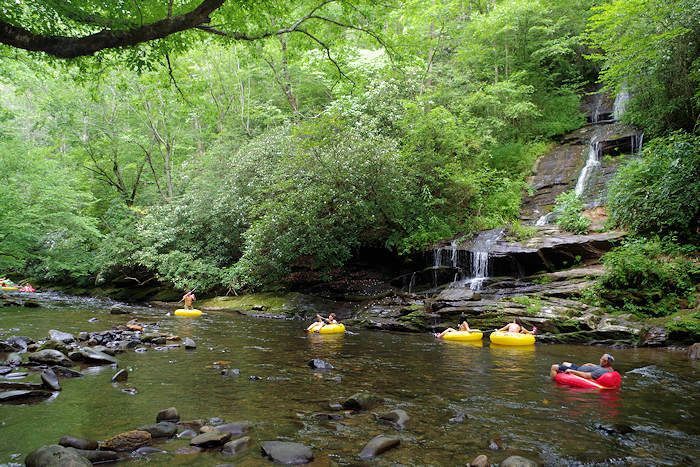 See our Cherokee Guide for more things to do. Nearby in the Great Smoky Mountains is the Oconaluftee Center & Mountain Farm Museum and Mingus Mill.